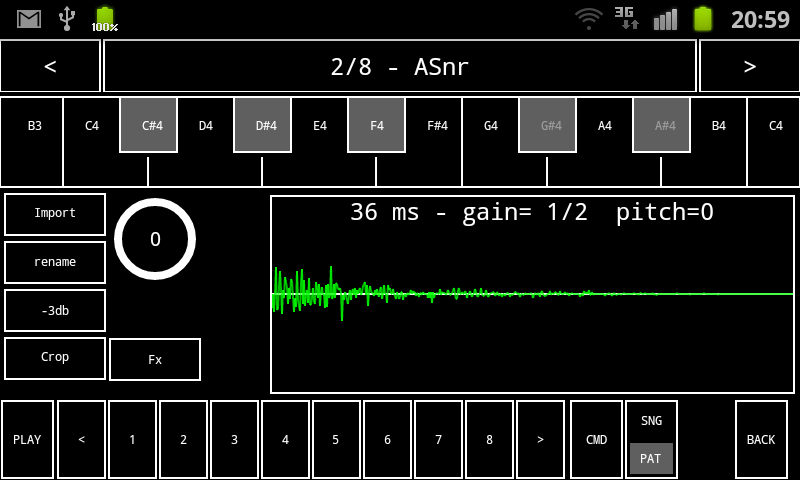 Pattern Sequencer (drag n drop controls). Audio Mixer ( Pitch Volume Panoramic Mute Arpege) control on each track. Live Effects : Echo, Filter (cutoff, resonance ) Flanger. Controls Automation (Mixer and Effects). Pattern navigation (32 patterns available). Beats per bar controls on each pattern. Individual loop points on each track. Loop point on each track. Can edit notes at eighth note and sixteenth note. 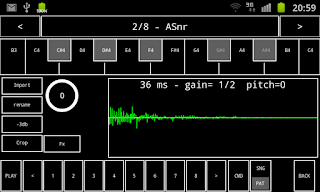 Import 22/44kz mono/stereo wav files on SD-CARD and use them as instruments in drumkits. Save and load patterns and songs on SD-CARD. Export patterns and complete songs as (16bits 8/22/44Khz mono/ stereo) wav files. Library of 20 patterns included various styles. 6 drumkits available (electro, accoustic, jungle, acid, techno, human beatbox). Samples library with 30 assorted drum samples.